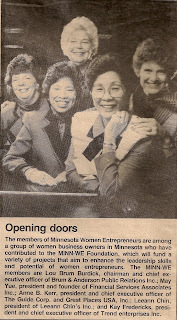 Leeann Chin emigrated to Minneapolis from Guangzhou, China in 1956, the same year I started flying with Northwest Airlines. 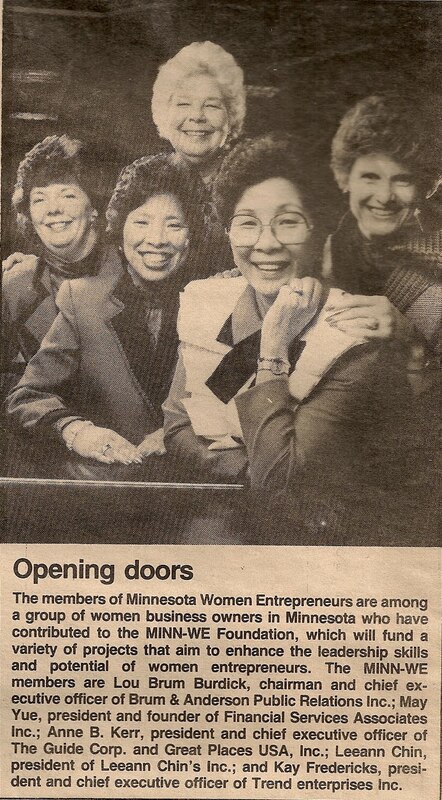 To my knowledge our paths didn't cross until the early 1980s when we were both active in the National Association of Women Business Owners (NAWBO) and MINNWE, Minnesota Women Entrepreneurs. Leeann and I participated as panelists exploring the business of women in leadership roles on several occasions. She didn't shrink from sharing family resistance to her career, always with humor and grace - not always with tact, which delighted her audiences. One of my favorite memories is a day Leeann cooked for several of us in her Kenwood kitchen. Leeann died on March 10, 2010, on Bainbridge Island near Seattle. Funeral services were held today in Edina, MN. Our paths diverged many years ago and I regret not keeping in touch. My love and best wishes to her family and all of her other friends, past and present, who mourn her passing.